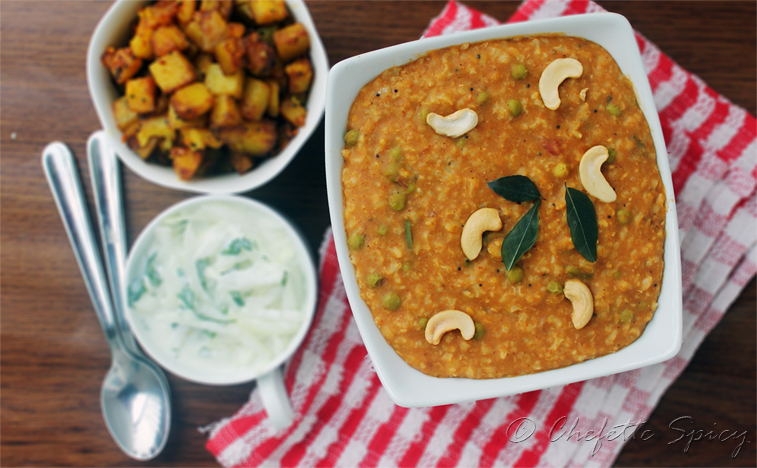 Pongal Post- Finally an Update! I am like the worst blogger. Ever. Okay, that is probably an exaggeration- neither do I update only once a year nor do I leave random burns on other blogs. But I am down there with the ones that seldom reply to the comments you leave on their blogs and the ones that never post recipes to yummy food they put up pictures of. Anyhoo, Happy New Year and Happy Pongal, people! I know, crappy pic but it was a rainy day and I had to click before anyone got to it, which meant switching on the kitchen lights in a very photogenic kitchen. Blasphemy, I know! So we got back down south on New Year day and hence began the same ol’. Preparing for the commencement of semester, running behind Aarabhi and finding a good daycare. All of the above were achieved, I went to school for a couple of weeks, we celebrated a rather important Indian festival, Pongal. We call it the Indian Thanksgiving but during the three days of Pongal, we show our gratitude to the Sun, the hardworking farmers that plow our fields of rice, without which almost all South Indians would starve! The first day of Pongal, called Bhogi, signals the end of one Tamil month (Margazhi) and the beginning of another (Thai). Until around ten years ago, people used to burn leaves and papers amongst other things, signifying the death of all things old and the beginning of everything new (and good). Well, the good news is that we have stopped setting fire to random combustible objects but Bhogi still means let the good times roll, baybay! The second day is the most important day of all four: Pongal. 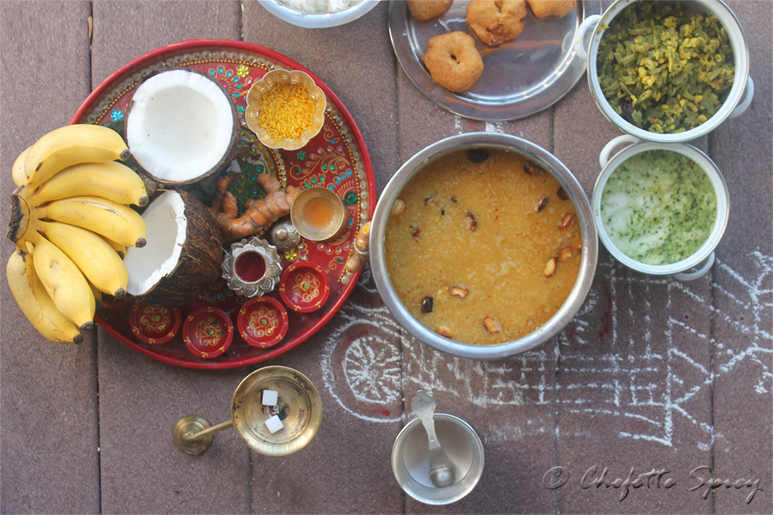 On this day, we make a huge feast which begins with boiling new rice with milk and jaggery. When this concoction boils over, we yell “Pongal-o Pongal”, which literally means “Boiling over, boiling over!” Sounds weird, right? It is actually so much fun at home, when all of us are peering over the brass pot perched on the cooktop, with a metal plate and ladle in hand. And when the white milk rises to the brim, bubbles up and starts overflowing, with clangs and clings, we yell (most of the time into each others’ ears) with all the lung power we can muster! After all the screaming (at the pot of milk by the whole family and later, by Paati at us to go take a shower), we get clean, wear new clothes, bring out all the yummy food and thank the sun for being merciful on our farmers and the crops. Phew! That was a pretty long narration. This year, Pongal was special because it was A’s first and for the first ever time since we got married, we had a set of parents at home with us to celebrate with. Thankfully the weather behaved itself too, a surprise since we have been seeing a lot of rains. 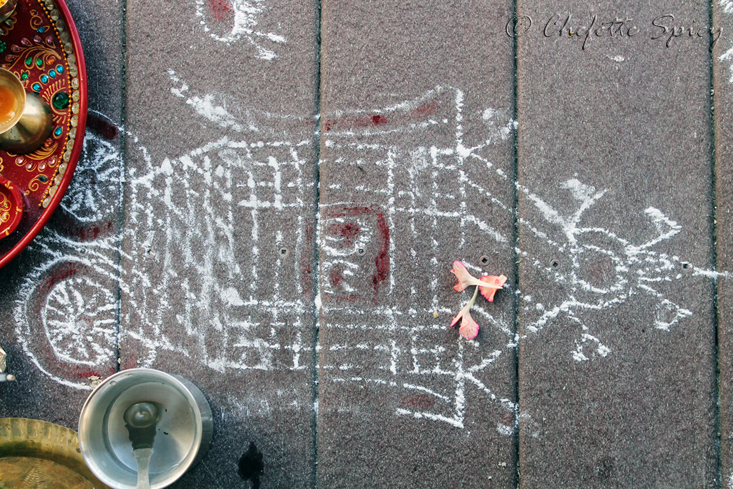 So about the blog: the url has changed! You can find us at http://www.chefettespicy.com from now. We have a new banner also. And as always, I will do my best at keeping the updates consistent and constant. Thassal, folks! Categories: amma, Chennai, Festivals, Food, India, Indian, Religious, South | Tags: celebration, family, food, fun, home, Indian, pagan, pongal, rice, sun, thanksgiving | Permalink. Holidays are here! Can you believe that it is already time for Christmas? I mean, it was only June yesterday but I woke up this morning to a very cold day and it suddenly hit me that we were nearly done with 2013. Last year this time, I was subtly pregnant and we were shopping for our trip to India. Although we are not due for a visit back home yet (or to deliver a baby), we are still shopping. Shopping for Christmas gifts that we would be taking with us while we visit family and friends back in East Coast. I am pumped about travelling back to where it all- K and my life together, my culinary Eureka moments and ultimately this blog- began. But I am more excited about meeting the family, showing them Aarabhi for the first time and catching up with the awesome family, especially my wonderful sisters and brother-in-law (they range from the age of six to eighteen, so I find it weird to call ’em that). Anyway, back to food. I cannot talk about Bisi Bele Bath without mentioning that our New Jersey aunt is a pro at making this wonderful dish. It is native to Karnataka, as she is and the spice mix she puts in her Bisi Bele is wonderful. Since I ran out of it last year, I used the store-bought Bisi Bele Bath powder by MTR and I have been in love with it since! But S Chithi did promise to give me the recipe for it this time when we go to Jersey. Kannadigas around the world are freakishly proud of this dish and rightly so because it is a one pot wonder and nothing can parallel the taste of hot hot Bisi Bele. Especially on a cold day like today. The name itself is an abbreviation. Called Bisi Bele Huli Anna, hot and sour lentil rice, the name is pretty self-explanatory. It is made of rice, Dal and tamarind and generously packed with other veggies and a hot spice mix. Sounds delicious doesn’t it?! So here is how I made it. Before we begin, let’s talk rice. Whatever you do, try to avoid using Basmati rice for this dish. 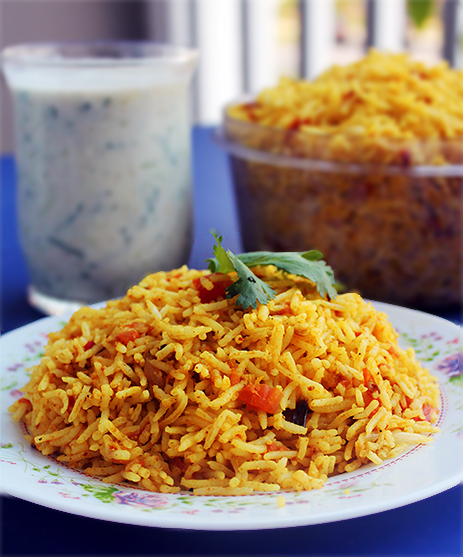 South Indian rice dishes seldom call for Basmati since it is predominantly used in the northern parts of India only. Moreover, and most importantly, using fragrant rice varieties like Basmati or Jasmine would alter the taste of Bisi Bele and that is really not what you want to do, trust me. If you are using rice bought from the Indian grocer, cook it together with the Dal in six cups of water until it turns mushy and runny. If you are using white rice bought from a store like Costco, cook them together in four and a half cups of water. This is because you generally need less water to cook American rice than you need to make Indian rice, whether it is Sona Masoori or Ponni. Pour two cups of water to the tamarind and extract thick juice. Heat the one Tbsp of oil in a huge pot. Fry the shallots for a few seconds. Add the tamarind water and peas to this. Let it cook for ten minutes on medium-low. Now add the peas, salt, Bisi Bele Bath powder, coconut and asafoetida. Cook this together for ten more minutes. 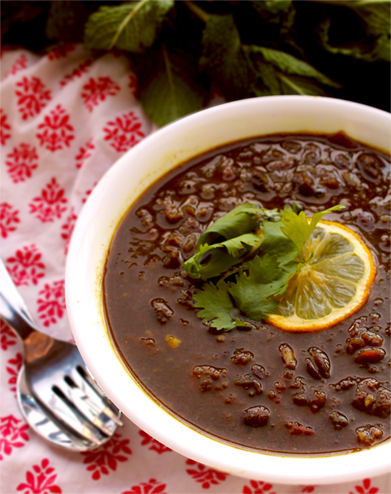 The tamarind water and peas have to cook and the spices have to mix and blend with the gravy. Once done, mix in the cooked rice and Dal mix in batches. The result has to be loose, runny and smell like your kitchen has suddenly transformed into Indian food heaven. Heat the Ghee separately. Fry the mustard seeds along with cashew pieces and curry leaves. Add this to the Bisi Bele Huli Anna and mix it up one last time. Since Appa decided to throw his strict diet out of the window for the day, I (guiltily) made spicy Potato Curry to go with it. Chips and onion Raita made our lunch brighter. Much yummy noises were made at the dining table. That made me a happy girl! Categories: Food, Indian, Recipe, Rice, Rice, South, Weekend | Tags: aunt, bangalore, bisi bele, bisi bele huli anna, cold, east coast, family, food, good food, holidays, in-laws, Indian, kannada, karnataka, new jersey, rice, south indian, spicy, winter | Permalink. Crabby evenings- Aarabhi is going through another growth spurt. Or that is what we think it is. It could also be because she hardly sleeps during the day and when evening strikes, she gradually goes into a tantrum-y mood. We haven’t figured this one out so we are still looking into it. Whatever it is, it has been mentally and physically draining everyone at home. So in-between trying to soothe her, writing a couple of exams for my Financial Accounting course (ugh, puke! ), trying to keep the normalcy going, we have also been doing our best at getting meals on the table. When I say we in connection to cooking, I mean Amma and me. Back to dinner, what started as an interesting version of a tomato rice I read somewhere on the blogosphere ended up becoming my own recipe. 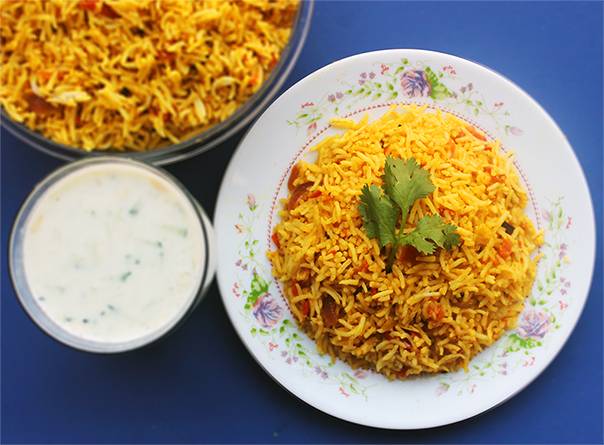 And after making it, I realized that it was very similar to the Biriyani recipe. Surprisingly, it tasted pretty different. We ate it with cucumber Raita but I do wish we had had some potato chips in the pantry. That was dinner done on a Wednesday and I swear I will keep my weekdays to merely photographing what Amma makes rather than getting adventurous in the kitchen. Phew! Two tsp Garam Masala, curry powder or any Masala really! Fluff the cooked rice and set aside. Heat the oil in a pan on medium heat and add all the tempering spices. When done, add the sliced onions and turn the heat to med-low. Let it caramelize. When light brown in color, turn the heat to medium and add the ground paste. Let it cook for five minutes. Now add the tomatoes, Masala, turmeric powder, cayenne pepper powder and salt. Close the pan with a lid and let it cook for ten minutes until the tomatoes are mushy and the paste is semi-solid. Take the lid off and let it cook a few minutes more until it thickens. When done, mix it with the cooked rice, make sure the rice doesn’t turn mushy. 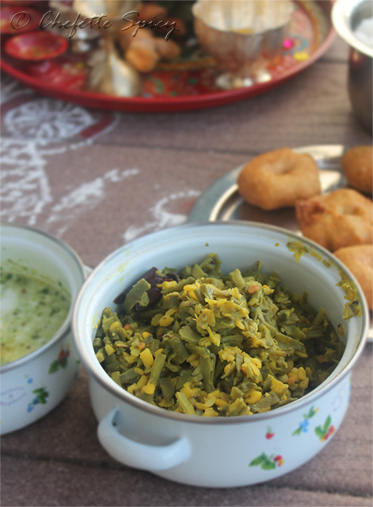 Eat as a side or as a main dish like we did with Raita. Categories: Aarabhi, amma, basmati, Food, Indian, North, Recipe, Rice, South | Tags: Aarabhi, baby, masala, rice, spices, tomato | Permalink. This is such a pleasure, the opportunity to blog twice in a week. Since school starts soon, I take it with open arms and without questions. I mean, I cannot put it past me to go through a non-creative spell pretty abruptly. You know how you come up with all your brilliant ideas right when you are about to go into deep sleep at night? This one happened to me yesterday as I was dozing off. Well, the recipe might not be a brilliant idea or an original but I fell in love with it and decided that I had to try it as soon as I could. So the rice thingamajig was “born”. This is a quick, easy recipe. So easy that the most difficult part to me was coming up with a name. I couldn’t call it a risotto unless I wanted to earn the wrath of Italians, Italian cooks and Italian food lovers. I didn’t want to call it fried rice because it was too mushy to be a success. I could not bring myself to call it Cauliflower Kalandha Sadham (mixed rice in Tamil) because I was afraid I would anger my late grandma, father and aunt so much that they would refuse to come to my aid when I invoke their spirits in the kitchen (ha ha). Hence, I decided to stop trying to be creative and called the big pot of creamy rice what it was- Creamy Cauliflower-Broccoli Rice… I still feel it could have made a beautiful risotto. Oh well, whatever! Cook the rice. Boil the cauliflower, broccoli and three whole pieces of mushrooms in salted water. When done (which takes roughly ten minutes), process it in the food processor along with milk, thyme, salt and pepper. Heat the oil in a pan. Melt the butter in it and add the onion and garlic to it. Cook it on medium heat. Once done, Add the creamy gravy and then the rice. Stir to mix completely. 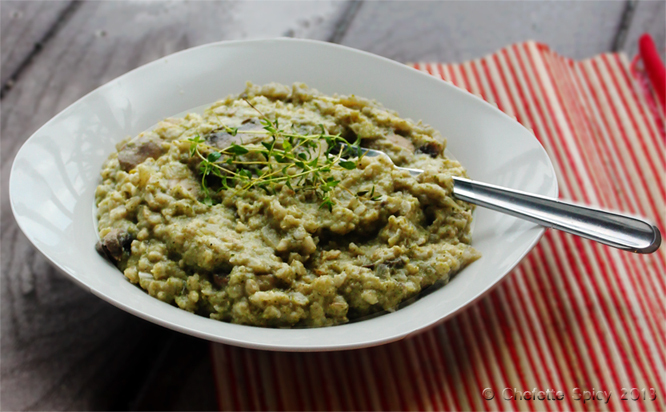 Add on the vegetable stock to give it a loose, risotto-like consistency. Finally, stir in the cheese and switch off the heat. 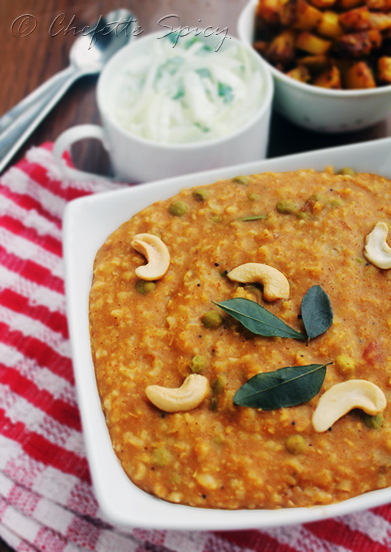 Like risotto and Sambar rice, this tastes best when eaten immediately. The hub added some store-bought croutons since he felt it missed that crunch factor. I am thinking of adding walnuts next time. Ps: This dish might lack in the looks department but dig deeper. It has a wonderful flavor that will not disappoint. 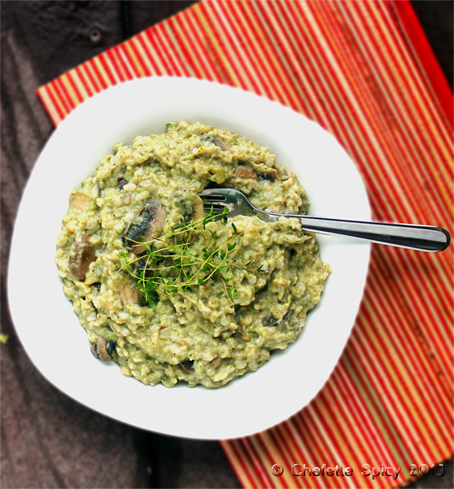 Categories: Food, Italian, Italian, Pasta, Recipe, Rice | Tags: broccoli, cauliflower, creamy, mushroom, rice, risotto, thyme | Permalink. This is probably the most basic recipe for Rajma and I am pretty sure most people are wondering why I am putting it up. Well, it was uber yummylicious and I figured it would be a sin not to click a pretty pic of it and share it with the world! Mom made it and she added a darn secret ingredient to it which made the dish pop with flavor and color. We had some left-over tamarind Chutney from all the food our friends ordered for my surprise baby shower last weekend (the shower was so wonderful that I am not done gushing about it yet. I cannot believe that my family drove all the way from New Jersey, Virginia and Atlanta just to give me a huge surprise! How awesome are they!!). Although the spring rolls and Gobi Pakoras (cauliflower fritters) are long gone, the dipping sauces are still gracing our refrigerator in air-tight take-out boxes. So this morning, after Amma made the Subzi and tasted it, she felt that something was missing. Putting her creative cap on, she quickly emptied half a container of the chutney into the Rajma. The result was a tangy-sweet and spicy curry that we ate with Roti and Basmati rice. And as always, I have a cup waiting in the fridge for tomorrow with my name on it. Man! Do I love leftover delicious food! Categories: amma, Food, From Amma's Trove, Indian, North | Tags: basmati, gravy, rajma, rice, roti, spicy, sweet, tamarind | Permalink. So I went back after the last post and thought to myself: why? Why would I write such an incomplete, mediocre post? What is so special about it? My less than good post was soon run down to the ground and I even toyed with the idea of deleting it but then, you need to begin somewhere. Now that 101 is behind me, I am going to forget it and move on. Okra or Lady’s finger (as we call it in India), is a wonderful, wonderful vegetable. When we were young eons ago, my sister and I would eagerly wait for okra day every week. Amma would make curry, Sambar (lentil gravy) or sometimes Raita out of it and oh, how tasty it will all be! In fact, my sister loved it so much as a child that she would have eaten lady’s finger everyday if she had been given the choice… but she wasn’t. Moving South now, I notice every grocery store stocking up okra in their frozen and non frozen vegetable isles, something new to me. In DC, we had to go to an Asian store to buy okra. So hoping you do find the veggie in your grocery store, I write this entry for an easy peasy Okra curry. My mother’s okra curry will always be the right amount of crispy/tender. No matter how bad a day she would have in the kitchen, no matter how many diabetic people lived in the house, her curry will always turn out perfect and healthy. So after a couple of failed attempts (only a couple since I am not that hopeless in kitchen), I learned to make the perfect curry. The one tip that I did make myself follow (a sensible one we all learn in the kitchen) is to not treat oil as my best friend. I denounced over using the pepper powder too. Okra one lb ends cut off and chopped into (not too) thin pieces. It takes a long time but it is so worth it. Pour a tbsp oil in a saute pan. When it heats up, add the mustard, Dal and asafoetida. When the mustard crackles and they Dal turns golden-brown, turn it to medium and add the tumeric, then the cayenne pepper and then the salt (in that order). If you are using the onion, add it to the pan and fry for two minutes. It doesn’t need to completely cook since it will continue cooking after we add the okra. Now add the okra, mix it all together. Turn the heat on to high briefly, for five minutes. Now turn it back to medium low. They key to crisp/tender okra is patience. 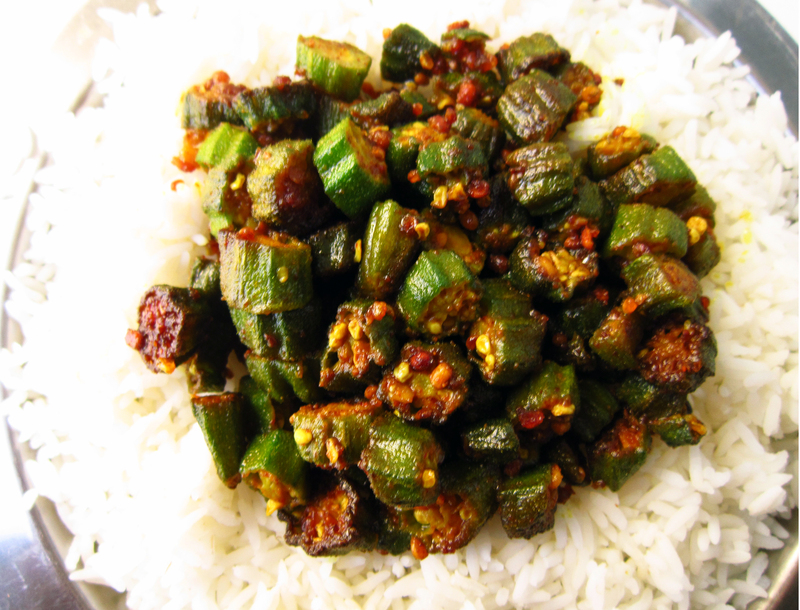 Don’t saute it regularly because the okra pieces tend to break and you will end up with gooey, not so awesome curry. Practice the art of zen and you will end up with awesome food. Saute it once in three minutes so that the okra doesn’t burn. It will be done in 10 minutes. You can eat it with lightly buttered rice, with an accompaniment of slightly salted yogurt or treat it as a side for Roti. Either way, this will taste unimaginably yummy. It wasn’t difficult, was it, now? 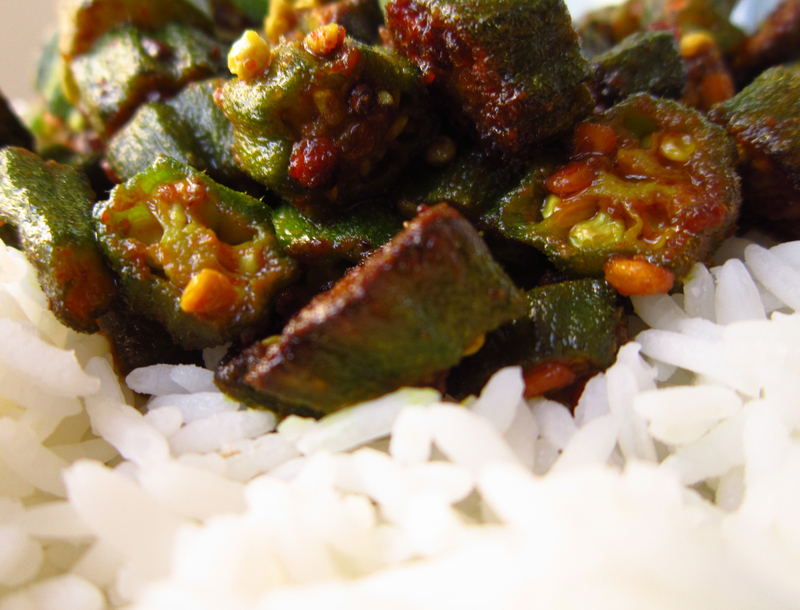 Categories: Food, Indian, Recipe | Tags: Indian, lady's finger, mother, okra, rice, roti, side, sister, south indian | Permalink. It was a cold night and I wanted to make something interesting, healthy and hearty for dinner. I was tired of the run-of-the-mill Sambar, Rasam and Curry and I am sure the Mister was too. I brought my copy of Vegetarian Creations out and leafed it through to that one recipe I have been dying to try. 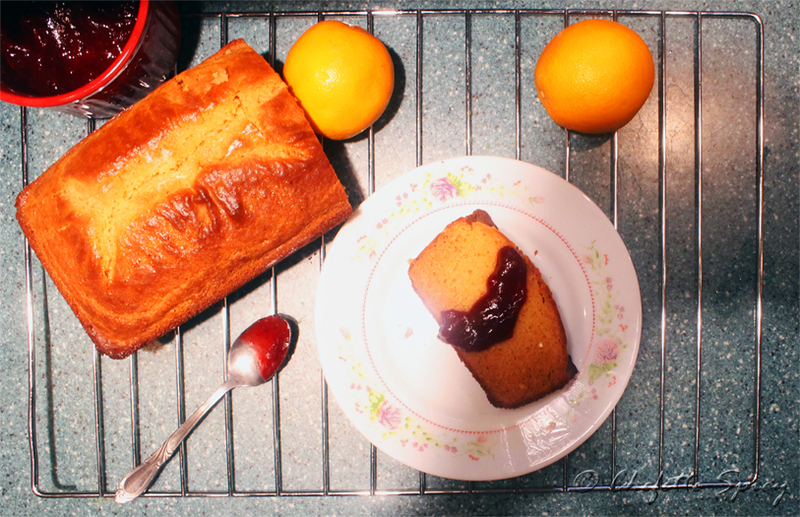 I have read the recipe so many times in the past one month that I knew the page number and the ingredients by heart. 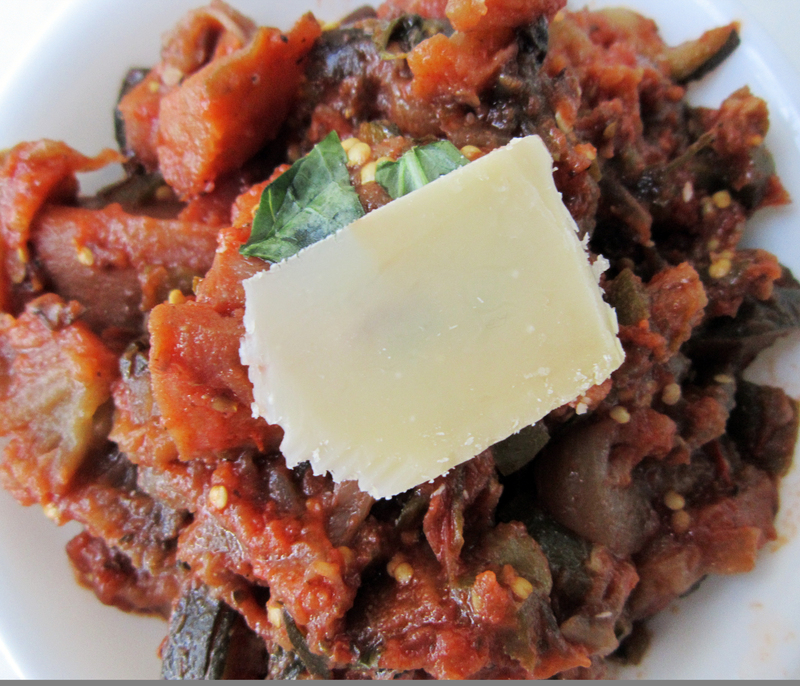 I first tasted Ratatouille in a Chennai-based Tapas bar called Zara. It is my most favorite place in the city to hang out with friends and the food in the bar is always so drool-worthy that it is safe to say that I used to frequent the place especially for their scrumptious platters. While the Cottage Cheese in Tomato Gravy is what I order most of the time, my secret favorite will always be Zara’s Ratatouille. Well seasoned and cooked to perfection, their Ratatouille always tasted tangy, spicy and wholesome. At Zara, they always served it with some rice, a dinner roll and freshly made coleslaw. What a perfect platter, right? So I decided to recreate the platter at home and boy, oh boy, was it worth it! Cut the eggplant into small cubes and salt it in a colander. After 20 minutes, pat dry with a kitchen towel. Meanwhile, chop other vegetables separately and mix salt, pepper and the other seasonings together in a bowl. Heat a huge (and I mean HUGE) pan, add olive oil and fry the onion and garlic over medium heat until onion is tender. Now add eggplant and zucchini and cook for five minutes. Finally add bell pepper, tomato, tomato paste and season it with the mixture. Cover and cook for 30 minutes over medium-medium low heat (alternate the temperature). Take off the cover and cook for (ideally) 20 minutes. If the eggplant is still a little raw (as it probably will), don’t hesitate to cook more until it cooks completely and the liquid is fully absorbed. 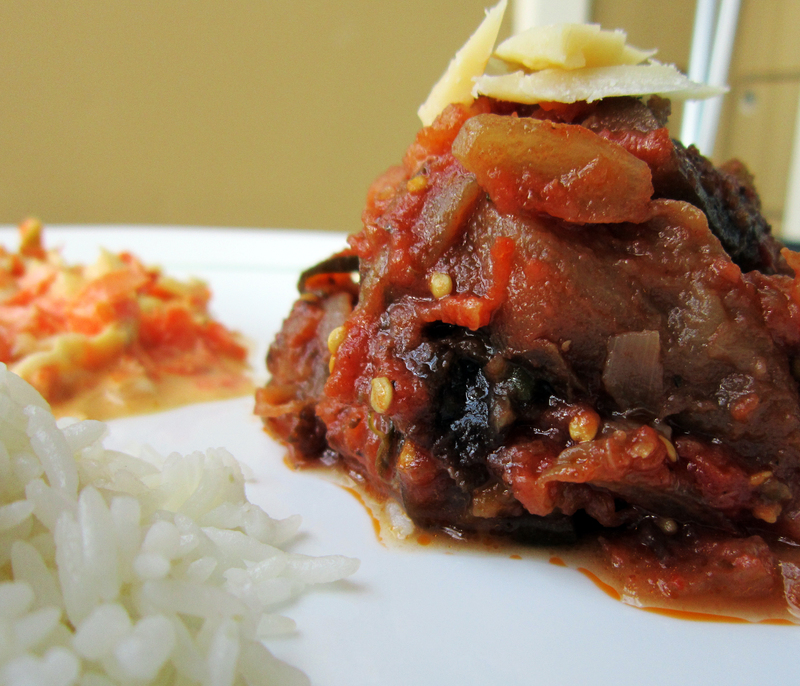 As I said, Ratatouille can be made a million different ways. This is just one of them. Categories: Food, Recipe, Vegetarian Creations | Tags: Chennai, Ratatouille, rice, vegetables, Zara | Permalink.